Is poor oral hygiene a cancer risk? Can Good Oral Hygiene Reduce Your Cancer Risk? A Lancet Oncology Journal study suggests that taking care of your teeth and gums may lower your chances of developing several types of malignancies. The Lancet Oncology study finds that men with a history of periodontal (gum) disease may be at greater risk for several types of cancer. In studying 48,375 men, ages 40-75, researchers found that compared to those without gum disease, men with a history of it had a 14 percent greater risk of cancer, specifically lung, kidney, pancreatic and blood cancers. The increased risk persisted even in men who had never smoked. The study adds to earlier research suggesting a link between periodontal disease and increased risk for cardiovascular disease and diabetes. Gum disease occurs when plaque accumulates below the gum line, triggering an immune response that can destroy the tissue and bone that anchor the teeth. Evidence suggests that inflammation, the body's immune response to injury or infection, plays a role in cardiovascular disease and cancer. Starches and sugars in the food you eat combine with bacteria in your mouth to form plaque, which causes tooth decay. If you don't clean your teeth, bacteria accumulate beneath your gum line and can trigger an inflammatory response. The body generates inflammation to fight this periodontal infection, but in doing so it can cause more damage. If you let bacteria build up and not be cleaned on a regular basis, the body is going to try to fix things for you. Inflammation eventually causes pockets between your gums and teeth that fill with bacteria and inflammatory substances. Eventually, the pockets grow deeper and can destroy the connective tissue and bony structures that anchor the teeth, resulting in tooth loss. At this point, the dangerous mix of bacteria and inflammatory substances can then access the bloodstream and travel throughout the body. 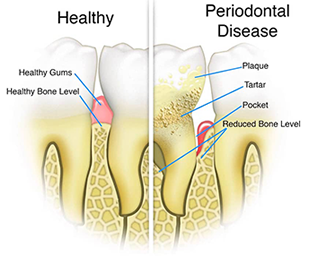 It is this process that experts believe may link periodontal disease to systemic diseases, such as cancer. The researchers noted that further studies are needed to confirm whether periodontal disease actually causes cancer and if good oral health can reduce cancer risk. Regardless, you don't need more reasons to maintain a healthy mouth. Dr. Larry P. Bleier is a Board Certified Harvard Trained Diplomate Periodontist who utilizes the latest techniques in the diagnosis and treatment of gum disease. There is no substitute for keeping your own natural teeth in health and comfort for a lifetime if you know how. Dr. Bleier can show you how.